We Paddle We Run We swim We Surf Come and Join the Fun with us. Phuket Provinical Administrative Organisation Lifeguard Training Program. Phuket Lifeguard Club will be working together with the Phuket Provinical Administrative Organisation (PPAO) to organise a training week from 4-8 September for 60 Thai lifeguards and potential lifeguards from Phuket area. 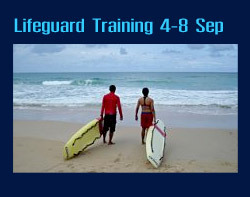 This training will be conducted by 5 members of Surf Lifesaving Australia, led by David Field, and will be based at Le Meridien Phuket Beach Resort, who provide a venue for this training and are hosting the Aussie contingent. The Royal Thai Navy will be working alongside the Australians as trainers. This is a joint project of the PPAO, Phuket Lifeguard Club and SurfLifesaving Australia. The first of many we hope! 115 Male Thai national Surf race indiv. 215 Female Thai National Surf race individual. 127 Male Thai national Beach Sprint individual. 145 Male Thai national Board race individual. 246 Under 15 Female Board race individual. 165 Thai national Iron Man individual. Note: the above list is subject to change on the day of the event. ©Phuket Lifeguard Club. All rights reserved.